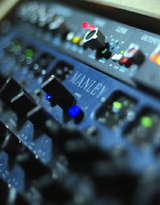 Contact Us Mastering isn’t just about loudness. Anyone can make a mix sound loud. Mastering is the final step in the production process. It’s a delicate balance of equalization, compression, stereo widening, and limiting carefully applied to give definition, energy and a beautiful final sheen to your mixes. Mastering is an art. It is the skilled craft of forming a sonically consistent collection of tracks into an album, EP, single, or demo package. At Eighth Nerve we focus on achieving the best possible finished result for your music. During the process we use a combination of vintage, esoteric, and cutting edge tools to create an end product you will be proud of. Unlike many other so called mastering services we do not use all-in-one plug ins or software only solutions. Each project is treated individually.